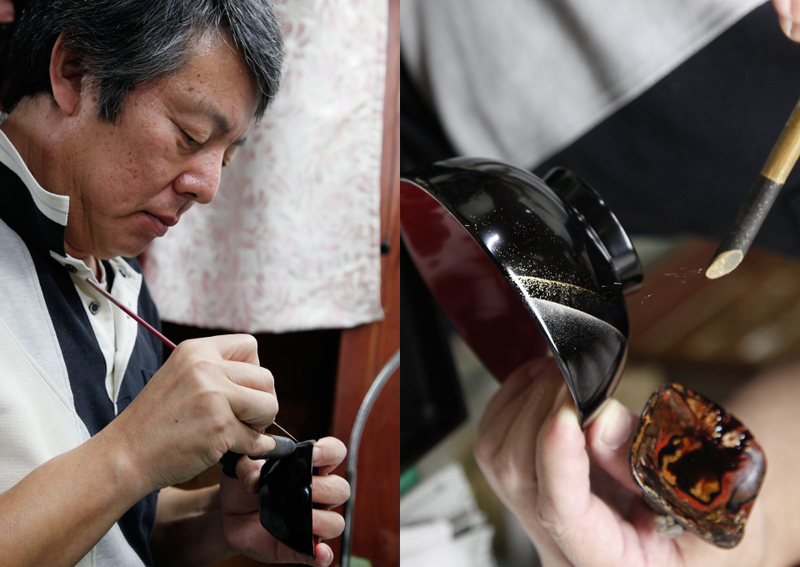 Roiro-shi, evoking beauty of Wajima Lacquer by own hands. Wajima Lacquer is one of Japan’s representative lacquerwares. Robustness realized by placing Urushi and Jinoko mixed with for layers is the major feature. Another point is its beautiful decorative work. This includes Makie, Chinkin, Roiro, and more. The person we would like to introduce first is Kiyoshi Ohashi, a Roiro-shi. Roiro might not be as well known as Makie and Chinkin. “Roiro is a technique to makes products glossy like mirror by polishing even after first coating is completed. Diverse decorative work is the remarkable point of Wajima Lacquer, and for other decorative works, Makie in particular, Roiro is important because brilliance of gold and silver becomes highlighted by doing Roiro polishing after Makie is done. Roiro is in fact a technique like an unsung hero”, says Mr. Ohashi. Of course, Roiro process makes the finish beautiful even by itself. The Roiro process involves a repetitive work of lapping and polishing. 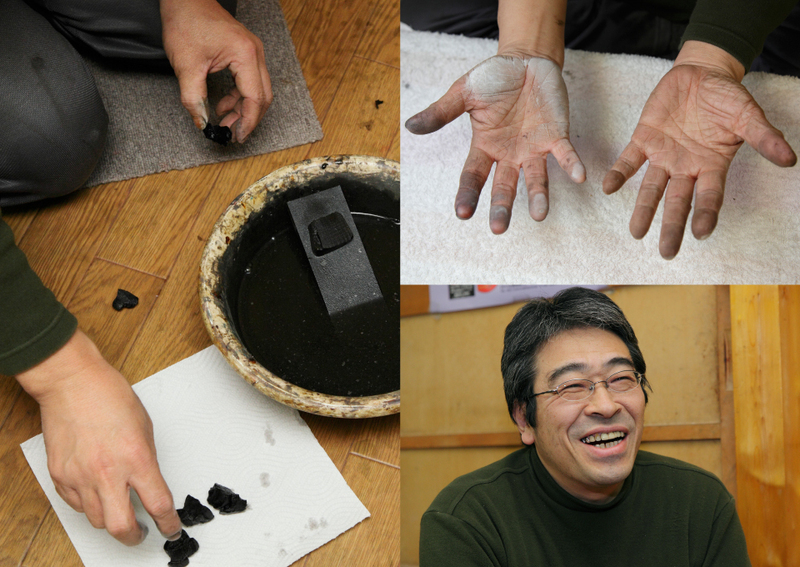 “Using quality charcoal called Suruga-tan we perform lapping to make the surface smooth first. 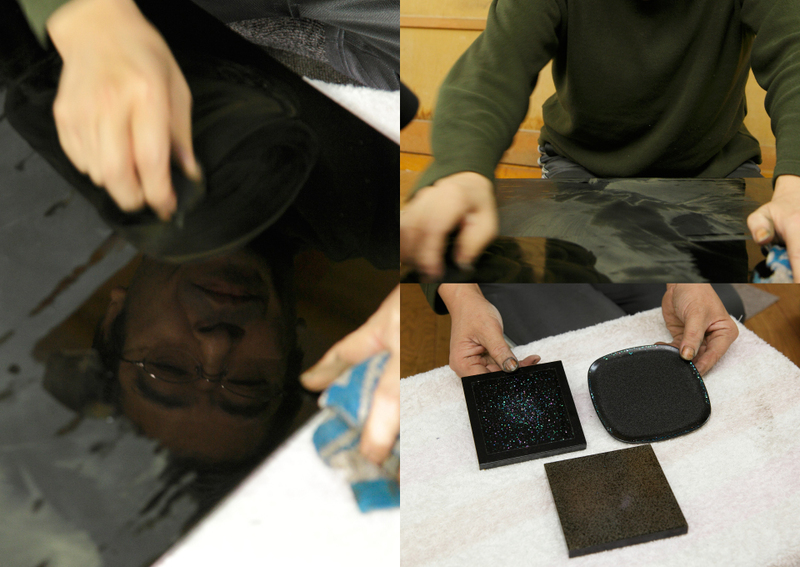 This process inevitably generates some scratches therefore we place raw Urushi once again, and perform polishing called ‘Doh-suri’, using Roiro-dedicated charcoal, plus oilstone powders and compounds. Finally, the tool we use for polishing is our hands. Human hand is a very sensitive tool. For example, a frame of TV set is polished by machine to make it glossy, and compared with such an industrial method, I believe human hand works definitely at a higher level”. Even though smooth surface is obtained already at the end of finish coating process beforehand, they lap and polish it again and again. Craftsmen compete each other at invisible ‘micron’ level. “In contrast to products made by machines, hand-made products involve unevenness in quality that go down to posterity no matter it is good or bad. This is the point we feel tough, but exciting”. Left・Upper Right：Roiro is a process that craftsmen perform polishing finally by their hands. They used to use oilstone and lamp oil, and thanks to technical evolution they also use compounds today. Bottom Right：Workshop of Mr. Ohashi. The space secured is large enough to perform Roiro on objects in big size. Left・Upper Right：The finished surface done by Roiro is like a mirror. Your face will be reflected like this. Bottom Right： In addition to Tsuyaage (Roiro finishing by itself), there are some different types of works such as Nashiji-Nuri and Ishime-kanshitsu-Nuri. Beautiful but textured patterns enhances characters of Wajima Lacquer. Left：Quality Suruga charcoal of Shizuoka is used for lapping at Roiro process. Cut it into suitable size and perform lapping in every detail. Started from coarse lapping, the fineness of charcoal is switched step by step, and at the final stage the finest one called Roiro charcoal is used. Upper Right：Mr. Ohashi’s Hands. His ultimate “tools”.Bottom Right： Mr. Ohashi, in fact entered the world of Roiro-shi from a company’s salaried employee when he was 26 years old. He also experienced a lecturer at Wajima Urushi Craft Technical Training Center. “Wajima Lacquer was produced from the nature and culture of Japan, and it is environmentally-friendly product. I encourage more people to feel it and learn the greatness of the techniques and the beauty”. The next craftsman we would like to introduce is Kosaku Kitahama, Makie-shi. 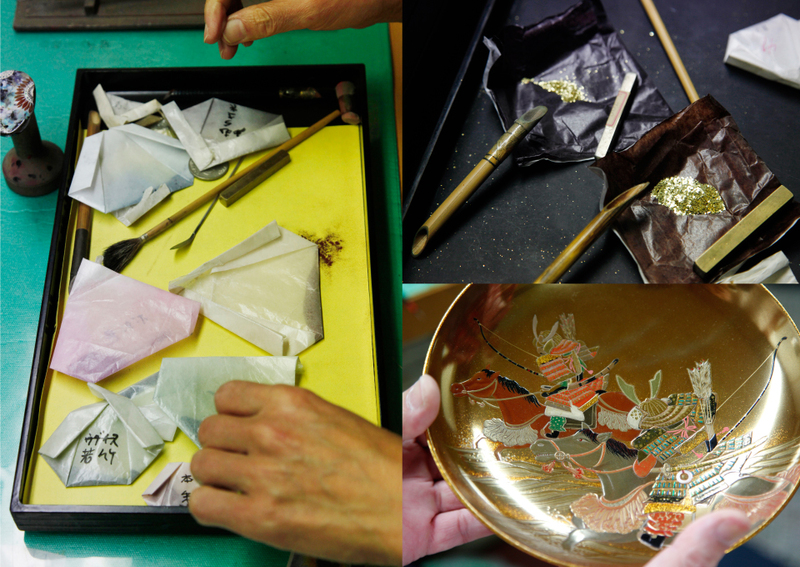 Makie is a technique to enhance gloss of gold and silver by polishing it after drawing patterns by Urushi, lacquering powder of gold and silver, and getting it solidified by Urushi. Craftsmen sometimes try a variety of ideas such as using Raden (inner surface layer of seashells) to describe something in elegance on Urushi. “The excitement to perform Makie is that the technique allows us to describe a three-dimension world on a single surface. Urushi really involves more to learn, and thanks to a variety of Makie techniques such as Togidashi-makie and Taka-makie we can realize things in many different ways. Because of that, we never see the same finished product even if external shape is the same. In a world of Wajima Lacquer craftsmen, there is a ceremony called “Nenki-ake” celebrating an apprentice to become a full-fledged, but tentatively. “My apprenticeship was tough. I had always been thinking when I would give up even after spent 3 years. Achieving techniques becomes true by accumulating the same works every single day. Young people may feel it tough. In fact, it may require as much as 10 years for them to gain appointment from customers. Wajima Lacquer is already a product beautifully finished even by itself. Therefore, we always keep a sense of tension as customers might say ‘We don’t need your Makie patterns’”. Kitahama’s family, the couple and their oldest son Satoshi, are all Makie craftsmen. “By looking at the work of my parents I had always felt their work was tough, but now I remember the trigger for me to start thinking about becoming a craftsman was that I felt beautiful when I looked at a finished product with Makie and polishing done”, explains Satoshi. He became apprentice to another craftsman first. After his Nenki-ake, he started working with his parents. “I would like to try to perform many different ideas of Makie on a variety of products. There are people expressing themselves by picture drawing, dancing. In my case Makie is that. I am still junior in the society of Makie craftsmen, but I want to work more in collaboration with youth having different types of senses”. Left：Mr. Kitahama, drawing patterns on a bowl in a serious look. This is the moment no failure is allowed to make. Right：By “lacquering” gold powders from the tube on the patterns drawn with Urushi, a delicate and beautiful world becomes appeared on a plain bowl. A “palette” of Urushi is on his finger. Upper Left・Right：Satoshi, the oldest son of Mr. Kitahama, works on Makie, having 11 years of experience as craftsman. 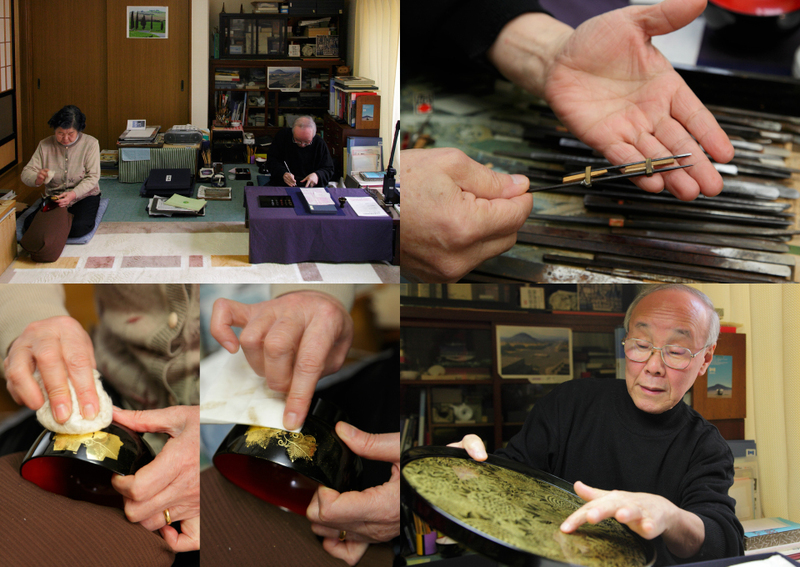 He told us that he would like to try what he wants to do in the Wajima Lacquer world. Bottom Left：A scene of ceremony he organized at the time of his Nenki-ake. Although it may look like a wedding ceremony, it was a place where he exchanged nuptial cups with his superior and to be recognized as a full-fledged craftsman. Left：Gold and silver powders are carefully stored in a piece of paper. Upper Right：Gold powders and the tube. Beautiful patterns are worked out on an Urushi canvas with them. Bottom Right：Some arts Mr. Kitahama worked out previously, brilliantly describing beauty in a variety of colors. Chinkin-shi, who takes new challenges all the time while applying its precise techniques. The last one we introduce here is Tetsujiro Yamazaki, Chinkin-shi. His experience as a craftsman is 60 years since he became apprentice at the beginning. 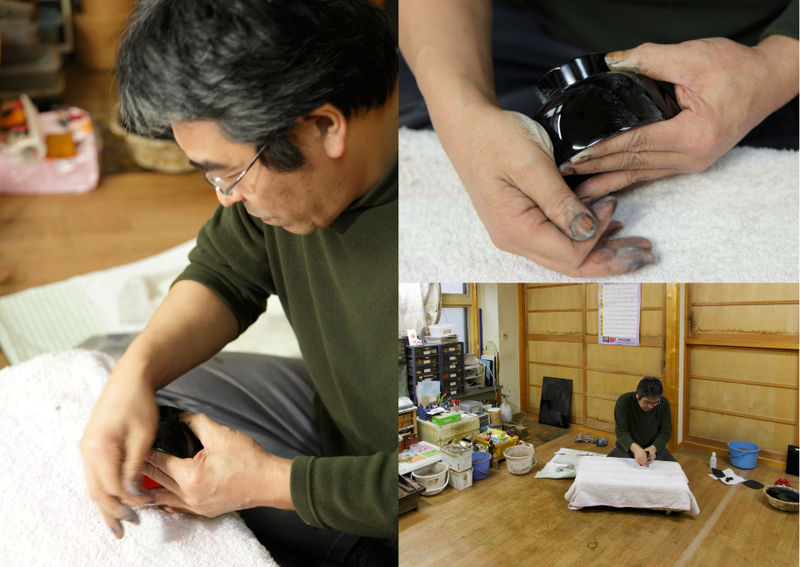 He now performs a principal role in Traditional Craftsmen on Wajima Lacquer. In 1986 he participated in an exhibition of traditional arts held in France. He also has an experience of performing demonstration of Chinkin techniques in the Palais de Congres in Paris. “The most job that I felt tough right after becoming apprentice was to keep sitting down all day long. First thing for craftsmen to do is to make own body enough to keep sitting all day, and develop the eyes capable to keep watching a single point. Like those required for athletes”. His superiors kept giving him tough coaching through his apprenticeship period. “Usually we sit down on a floor cushion while holding a ‘pillow’ that helps to keep arms and body stably in position, and my superior often said to me ‘Get out of here with your pillow’. I did as said and came back, and I found he was in a good temper every time”, explains Mr. Yamazaki with a smile. After his Nenki-ake, he has worked on many different jobs under several craftsmen as a knight-errantry for 5 to 6 years. “I mastered different techniques and became acquaintance with Nu-shis coming over during that period. I was in earnest to gain their trust because they kept watching what I would do all the time to assess ‘how good this guy will work’. My colleagues that I have met at different occasions also became my very important assets. Through exchanging opinions and organizing show events with them, I have got many friends even in such a small Wajima city”. In addition to jobs that have been offered since he was young, he proactively challenges to make the own arts and to apply for art shows. Mr. Yamazaki, who has gained a variety of prizes, says the excitement of Chinkin technique involves designing. “I look at various pictures at museums, get into nature for sketching. Ideas are available anywhere, but I was not aware of it when I was young. 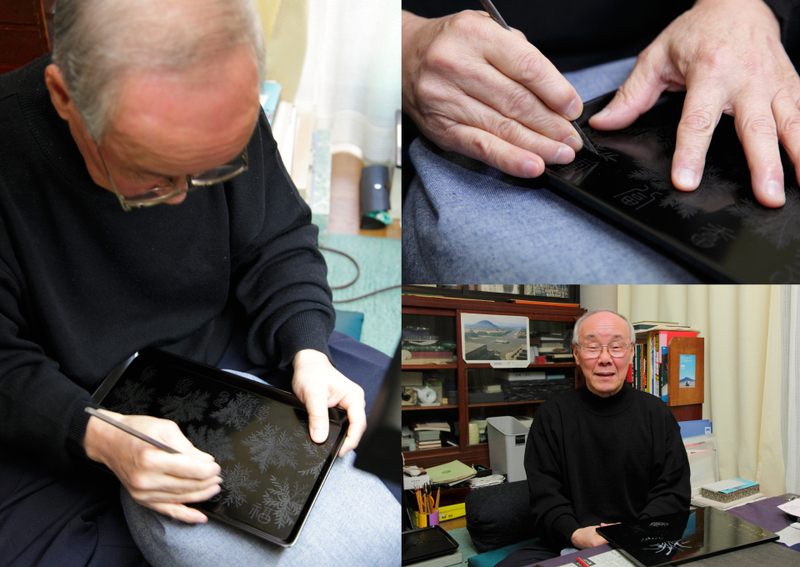 In recent years, I learned calligraphy and obtained the mastership”, says Mr. Yamazaki, who keep challenging new things even after his 60 years of career as a craftsman. The most significant thing we felt during the series of interviews with Wajima Lacquer craftsmen was that all of them never become satisfied with their current status and keep trying to make next things the best. This may have to be something called craftsman’s spirit. Left・Upper Right：Mr. 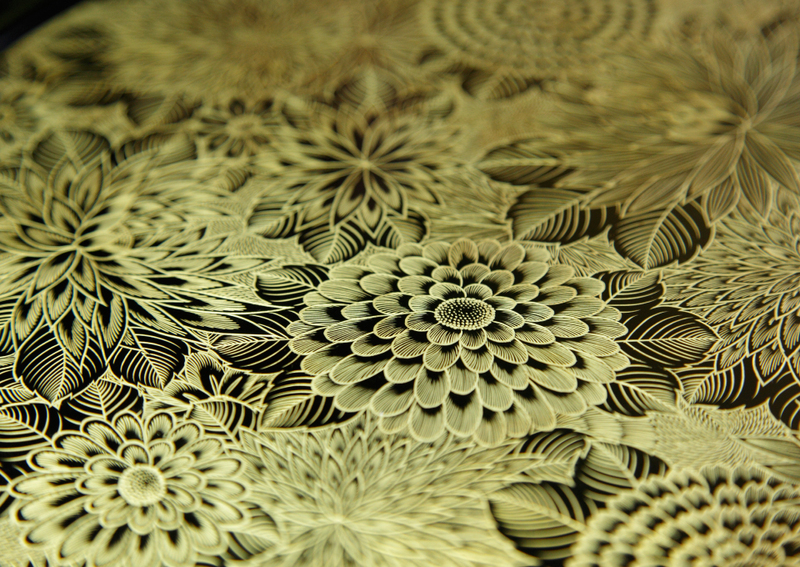 Yamazaki engraves patterns carefully step by step on a bowl. “My apprenticeship started to make dots. It is called dot engraving, and I repeated to do it every single day”. The thing put under the bowl is “pillow”. Bottom Right：Despite his experiences for more than 60 years, Mr. Yamazaki still devotes himself to find ideas of designs by reading various books, going to museums, and sometimes getting out into nature for sketching. Upper Left： The wife of Mr. Yamazaki is also a veteran craftsman in fact. She sometimes gives her husband severe comments. 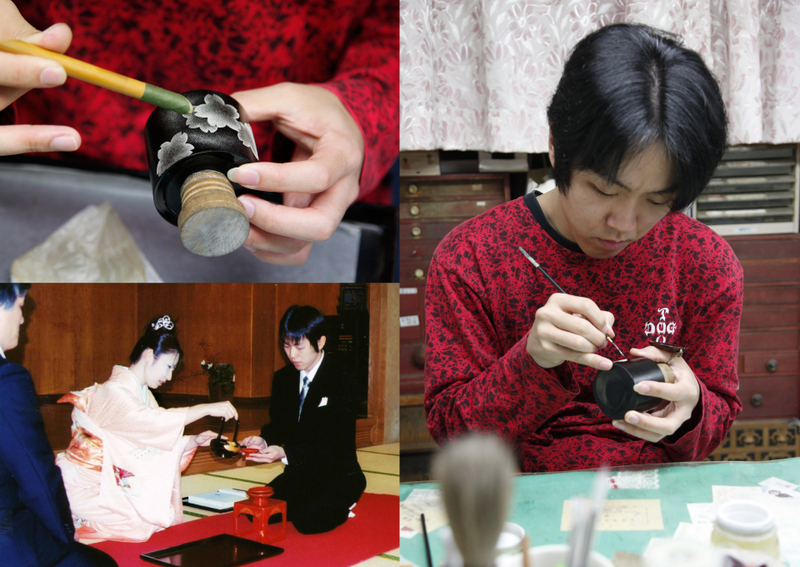 Bottom Left：She now performs placing Urushi on those her husband engraved patterns, placing gilt and polishing it. Beautiful patterns in gold came up. Upper Right：Tools used for Chinkin process. The one in his hand is a tool to draw circles. All of different chisels are carefully sharpened. Bottom Right：Mr. Yamazaki, introducing us his arts. Arts of Mr. Yamazaki that he showed us. Very precise lines are drawn in layers, describing the wonderful elegance.